Dragon Door: In your experience, what is the biggest misconception trainers have about training elite athletes? Dan John: Misconception number one is thinking that elite athletes are something un-human, not of this world, alien or foreign, and that you have to constantly invent new things for them. Cinnamon is not good enough, and so you make everything too fancy. But the truth is, it's quite simple. The second misconception is the idea of "more". More flexibility, more strength, more endurance, more work capacity, more, more, more, more, more. The truth is, enough is enough. When most people train an elite athlete, they only get them ready for one day. And yet in baseball there’s 180 days with 162 games sprinkled in. Football has a very long season. I have had track seasons with 26 track meets, and in one year I had 20 highland games. You can't show up shredded with six pack abs and last 180 games. There's nothing wrong with having six pack abs and being shredded, but you're not going to survive the whole season. You're going to throw away all those millions of dollars just to look pretty on day one? Dragon Door: You've had a ton of experience training elite athletes. Can you elaborate on who these athletes have been, and what you see as some of the common denominators? Dan John: Generally I don't name names or team names. The person who really shaped a superstar’s life might have been their kindergarten teacher. So I don’t want to be the guy that puts up a sign saying "I trained 400 Olympians" because we all know that's a bunch of junk. But, I have trained guys with Super Bowl rings, All Star baseball players, several professional teams, the most elite fighting forces in the United States, and rugby programs from all over the world. I’ve assisted and talked to many college teams—and of course there's track and field and highland games. The most common thing with elite athletes is that when you look at their roots, where they came from, it's not what a typical parent would expect. One guy—we can share his name since he's retired, John Buck—told me one time when we were training that the key for him was that his babysitter was an very famous gymnast, and taught him and his friends gymnastics while babysitting. Later, he got into BMX racing. He always felt that the lessons he learned from gymnastics and BMX racing were far more important than just standing behind the plate and taking swings with his bat. Most of the time, elite athletes played multiple sports. It’s an insight I learned from both John Powell, world record holder in the discus, and the great Olympic lifter, Tommy Kono. It’s a tough thing for most people to hear, but once you specialize, if you are not world class in three years, then you're not good enough. That's a heartbreaker for a lot of people. They'll say, "Well little Wendy's playing year-round soccer or volleyball…" But what you hear from every elite athlete, and every good coach is that the moment you specialize, that clock—that atomic, James Bond, Star Trek, count down clock that goes 3...2...1... and then Sherlock Holmes or Captain Kirk flips the switch—starts counting down, and you don't have a ton of time to be world class or top of your game. For example, take a boy in 7th or 8th grade and say that you don’t want him to play any sports other than baseball or basketball. If he isn't nationally recognized in three years, then it ain't going to happen. He might be able to play junior college basketball or NAIA or division 3—or even division 1, but he will not be on top of the game. There are exceptions—because there are always exceptions—but almost universally, once you specialize as an elite, the clock is ticking. It's very important that you listen to this concept. Because after three years, you should have the body and the performance record that would be recognized by the rest of us as superior. In high school I played football, and competed in wrestling, hurdles and discus. I played Catholic Youth League basketball, and soccer as a goal keeper. I did Olympic lifting for half of the year. The real leap in my career happened once I kind of specialized. But here's the interesting thing, even though I was a good national-level thrower, if we compared Tommy Kono and John Powell’s numbers, they were right I would not be an Olympic champion. By they way, this is all about elite athletics, if you need a hug, go try something else! Dragon Door: What are the three most important qualities an athlete should look for in their trainer? 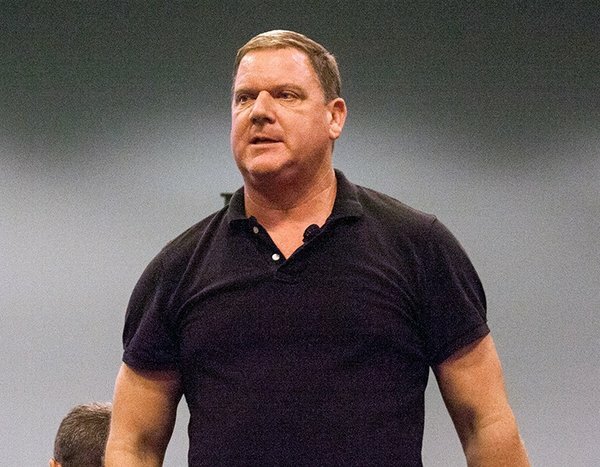 Dan John: In a coach or trainer? Make sure they’re not an idiot! And first, the classic—someone who will do no harm. That goes all the way back to Hippocrates. Make sure the coach or trainer is someone who won’t hurt you. Number two doesn't fit my normal formula, but look for a coach who’s not trying to make a name for themselves. That’s a tough one. Everyone is always trying to get a piece of elite athletes, Navy SEALS, and all the rest. You want someone who's grown up past that. The third thing is to look at their toolbox, or their quiver. If they only have one tool—even if its a good tool—then they are not going to be good for an elite athlete. If you go to an Olympic lifting coach that's fine, they can teach you a lot of things, but a 27-year-old baseball player doesn't need Olympic lifting. Of course lessons learned from Olympic lifting do carry over well into coaching a baseball player. And many people never did anything except for kettlebells, and there's nothing wrong with that. But if you the answer you have is these six movements, then you're not going to help an elite athlete. You must have more tools. And by the way, even if kettlebell swings aren't the answer for you or your elite athlete, it might be something else in the hinge family, if you follow. Many elite athletes can't take any more ballistics to certain parts of their bodies. Their lower backs, knees, and shoulders are often hanging on—I hate to say it—by threads. Dragon Door: What kinds of exercises/modalities/equipment have you found to give the highest yield in improving your athletes' performance? Dan John: Every single one. The tool is secondary. Now, having said that I'm a huge fan of kettlebells, TRX, and barbells. I also have Bret Contreras's hip thrust machine, a Concept 2 rower, an Airdyne, rings, parallettes, ropes—you name it we have it. But sometimes, I've been in situations where all I had was an ammo box. So, the tool is secondary, and the focus on the movement is primary. I also tell people the third most important thing is load. When you're first coming up as an athlete, you're looking to bench 100lbs, then 200lbs, 300lbs and then 400lbs. But when you’ve been around for a while you don't worry so much about that number, you're more concerned about the balance of your training and movement quality. Programs are also overrated. "We're doing a program!" Well, when you’re working with a major league baseball player, you don’t have a program. If a guy comes in who took his knees out last night, you're not squatting today. If the guy has to shoot up just to walk, you're not doing that fancy little program you designed! When I work with certain teams they come up with some really good ideas. They do the standard A-B-A-B system where you do same but different. It’s basic, if you row one day, you do pull-ups two days later. They found that while A-B-A B-A-B might normally be considered a two week rotation, for them it could take five, four, or thee weeks. That understanding is one of the signs of a good coach. They understand that recovery is the biggest issue these poor guys and gals have. Not just doing more. It's hard to put on your uniform that many days in a row. Think about the NFL. These guys are probably showing up to mini-camps now. In the next months, they'll put their uniforms on in July and some of them will play all the way through February. In hockey, they play every night, back to back to back to back. And the NBA has those road trips. Imagine some psycho coach who says that today’s a "5 sets of 5" day because they have it written on a little piece of paper! The answer is that you've got to be reasonable with elite athletes. They want more until they realize that they need less. It’s an odd little transition to watch—it’s fascinating. "More, more, more, more, more... I need less, don't I?" Yes you do. Most collision sports athletes don’t survive long enough to understand that less is more. Dragon Door: Last question... You are a world-renowned coach, but you appear to be very open to improving your own skills by listening to others. Who do you turn to, to refine your own game? Dan John: Well, let's see… I like to work with those other seven billion people on the planet earth. I call each and everyone of them every single day to ask! If you are one of my mentees, interns, or assistants, I will ask you to adopt an underserved community. Taylor Lewis for example works with people who have cystic fibrosis. I work with a couple of people who have MS. Breast cancer patients are another underserved group of people in fitness. The other day I met this wonderful young lady who is deaf, we had a wonderful talk. The deaf and probably the blind are other underserved communities. But if something you do works with cystic fibrosis, MS, or the deaf, and it works with an elite athlete, then you can be pretty sure it will work with everyone else too. This might sound like the opposite of what you’d want me to say, but I like to listen to people who struggle to get into the gym. People for who it is a struggle to want to be in touch with their bodies in a positive way. I also look for people who are on a different Tack, people who look at things a little differently. 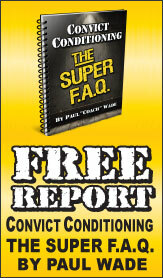 In Max Shank's book, Ultimate Athleticism, he includes a couple of exercises that I never would have considered. So what did I do? I bought some equipment and tried them out. I learned that there was a huge gap in my training and coaching. I like talking to a guy in California named Barry Ross who only works with sprinters. If something doesn't make them faster, then he throws it out. And in our RKC community there are lot of people I like to talk to. One you might not remember is Jim Hooper, an RKC out in Newport working with beach volleyball players. If something can makes a beach volleyball player improve their jump, then it’s obviously pretty good! Concerning fat loss, I'm a big fan of Josh Hillis of course, because he's out there in the trenches working with people and transforming lives. A person I really like talking to is Taylor Lewis. He works with the cystic fibrosis patients and the most famous baseball players in the history of the game. So when you hear something from him, it's always right! I just did an RKC with Chris White and Chris Holder, and took some notes. I have my ear to the train tracks on a lot of people. But it’s also been frustrating in the last couple of years. There are a lot of people I don’t mention because I suddenly realized one day that they got themselves stuck. And that's fine, and there's nothing wrong with getting stuck, except that things come up, things change, and you can't always bully your way to the next answer. Something else I strongly recommend—and it’s a little different but it's part of my answer—is to read classics and epics, and books and movies that challenge you a little bit. I have yet to read a book that's an epic that hasn't made me realize something huge. If you lose a track meet, throw the discus out of bounds, or get pinned in a wrestling match, then pick up a book that's epic. You’ll about read how that was just today, and you will be challenged to get back up. That's why I always recommend that my athletes do their best to really expand their great books reading. I read a lot. I like Danny Kavadlo's book Strength Rules, where he has that three point thing I found hilariously insightful. And yeah, it is that simple. But that same week, I was also reading Skippy Dies, that classic from Ireland that is not simple. It's very complex it expects a lot from the reader, and I think you need to read both types of books. 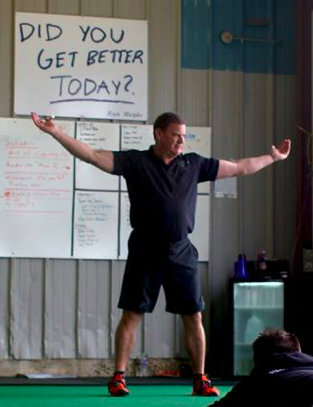 Dan John will present Strength Training for the Elite Athlete at this year's Health and Strength Conference in Minneapolis, Minnesota. Prefer to register by phone? Call 1-800-899-5111.